Are Liverpool or Manchester City fresher for Premier League title battle? City travel to Crystal Palace on Sunday in an attempt to leapfrog Liverpool at the top of the table, but the Reds can reclaim the summit later that afternoon hosting Chelsea in a pivotal clash, with both matches live on Sky Sports. Pep Guardiola's men are attempting to achieve the quadruple, having claimed the Carabao Cup, reached the FA Cup final and the Champions League quarter-finals, where they host Tottenham in the second leg next week - looking to overturn a one-goal deficit. 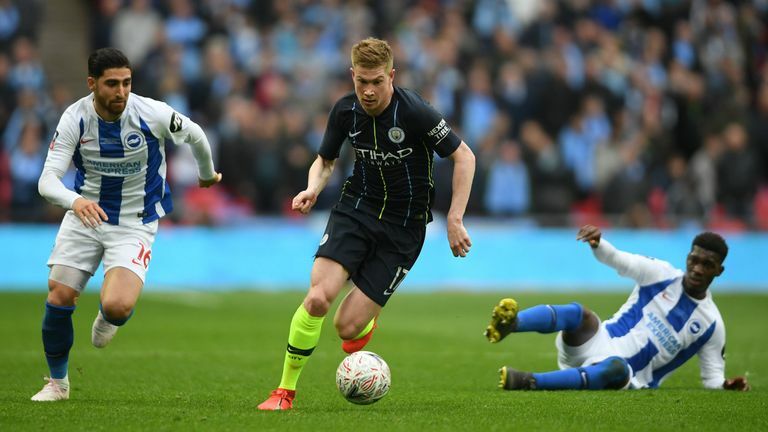 Kevin De Bruyne and Bernardo Silva reflect on Manchester City's challenge to win four trophies. 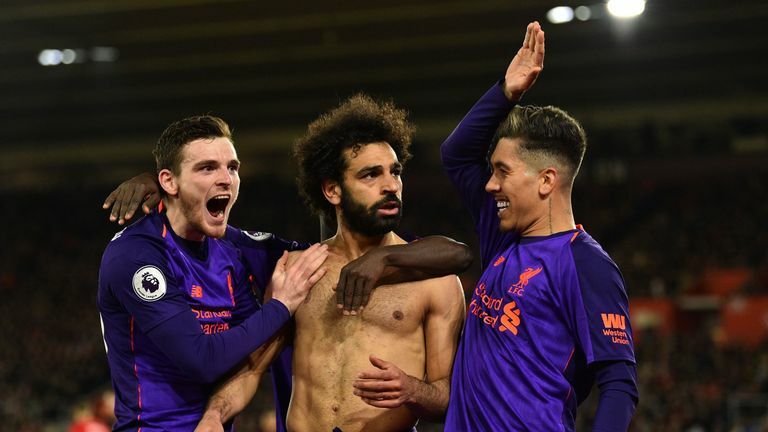 Liverpool are looking to end a 29-year wait for the domestic title and made huge strides towards a place in the Champions League semi-finals with a 2-0 win over Porto on Tuesday - having lost to Real Madrid in the final last year. On paper, Chelsea will be Liverpool's toughest test in The Run In, with their following two league fixtures against struggling Cardiff and already-relegated Huddersfield, before closing the season with games against Newcastle and Wolves. Manchester City are the league's form team with eight successive league wins and have not dropped points since a 2-1 defeat against Newcastle in late January, while the Reds ceded ground with a goalless draw at Everton last month. But the Reds hit season-high form during the festive period to capitalise on City's dip around the same time to leapfrog the reigning champions atop the table. The graphic below shows how City's three defeats in December proved costly. Since then, Guardiola's side have restored defensive solidity but not quite rekindled the scoring rate in front of goal achieved through November. Jurgen Klopp's men have conceded a league-low 20 goals in the Premier League but have not been as watertight in recent months, while scoring late, match-winning goals in their past two games to maintain their title tilt. In contrast, City typically shipped goals in the first half before Christmas - conceding after just 43 seconds against Hoffenheim in October. But the Manchester club have increasingly conceded later on as the season has progressed - most recently Heung-Min Son's 78th-minute winner on Tuesday. City currently appear to be suffering from tiredness or conserving energy after hitting season-high averages for distance covered during their dodgy December - with incremental declines over the past five league games. In contrast, Liverpool have increased their distances covered steadily since plummeting to a season-low average last month. That same trend emerges with even greater disparity when analysing sprints, with City dropping to fewer than 100 per game and Liverpool's average ascending to in excess of 130 in recent weeks. Liverpool full-back Andrew Robertson has covered more distance in the league than any other player from either club this season, clocking 327km to date - just 9km short of the equivalent of running direct from Anfield to Stamford Bridge. The graphic below shows how many injuries each team have sustained each month. Liverpool have suffered around 50 per cent more injuries than their title rivals, with players sidelined 77 times this term - compared with City's 53 to date. According to physioroom.com, the Reds have picked up more injuries or matched City in every calendar month during this campaign, with the exception of this month so far. However, despite the fixtures piling thick and fast and the pressure ramping up, both clubs enter the business-end of the season relatively injury-free. For Liverpool, Alex Oxlade-Chamberlain has returned to training after being sidelined for one year with a serious hamstring injury but Adam Lallana is a doubt for the Chelsea game this Sunday. City will be missing Oleksandr Zinchenko while top runner Bernardo Silva is also a doubt for their trip to Crystal Palace this weekend. City have had a greater degree of team rotation during The Run In - recording twice as many changes in February and making seven changes against Cardiff before the 1-0 defeat to Spurs in the Champions League. So City should be fresher going into the final month but must contend with two more fixtures than their rivals - they beat Brighton in the FA Cup semi-final and will face Manchester United in the rescheduled derby on April 24. The title race is almost perfectly poised, with City's one-game advantage weighted against a heavier and far tougher fixture schedule. The graphic below shows the league positions of the title rivals' upcoming opponents. Both teams face top-six opposition before City play their game in hand at United, which is perfectly poised to be the title-defining game. So it's advantage Liverpool in Europe and Klopp's side will also keep top spot in the Premier League with a result against Maurizio Sarri's Chelsea - but their league-leading defence will be braced to face the in-form Eden Hazard. City haven't faltered for eight league games but their defeat at Tottenham on Tuesday could unsettle that run, while Guardiola's men have also stepped off the gas recently - albeit against lower-table opponents Fulham and Cardiff. Liverpool must overcome their final top-six opposition when Chelsea visit on Sunday and capitalise on a favourable run-in, while also hoping that Manchester United can nullify City's game in hand on April 24. The Reds will want to secure a result early and end the recent habit of resorting to late match-winners, but Klopp's side could still hit the wall - having run further and made fewer line-up changes than their rivals. Watch Crystal Palace vs Manchester City and Liverpool vs Chelsea live on Sky Sports Premier League from 1pm on Sunday with City's match kicking off at 2.05pm and Liverpool's game starting at 4.30pm.